At its May 19 meeting, the board of directors of the Baptist General Convention of Oklahoma approved a 2010 Cooperative Program objective of $26 million and voted to send a strong statement to Gov. Brad Henry urging him to sign two House bills. Board members also heard from Executive Director-Treasurer Anthony L. Jordan and presidents of its four affiliate organizations. The $26 million objective is a conservative budget goal based on CP giving in 2008. It is slightly above the 2009 budget of $25.2 million, and will go to messengers at the state convention in November for final approval. Jordan said it should not go unnoticed that while Cooperative Program percentage giving has declined in the Southern Baptist Convention for 24 straight years, Oklahoma CP giving has increased with churches in the state giving an average of 9.4 percent. “Oklahoma Baptists are faithful people and believe in what we are doing,” Jordan responded. The two bills on the governor’s desk are pro-life bills. House Bill 1595 would require abortion doctors to provide information on female patients, including age, race, marital status, number of previous pregnancies and reasons for seeking an abortion. It would also prohibit abortions based on the gender of the fetus. House Bill 1114 would ban human cloning and embryonic stem cell research. In his remarks to directors, Jordan said he and the BGCO leadership team have traveled the state listening to directors of missions to hear about the work of churches and associations. “I have seen the heart cry of the people and a hunger for revival, people committed to prayer and a deep cleansing of their own souls,” he said. He noted the DOMs have talked about the revival of revivals. He said he has also seen a significant increase in church planting with the help of the North American Mission Board, associations and local churches. Jordan acknowledged that bivocational pastors need encouragement, people to come along side them, to partner with them. “They are carrying full-time jobs, while also serving as pastor,” he observed. He also said the vast majority of pastors in Oklahoma have never seen the inside of a seminary classroom. Jordan said Jerry Rankin, president of the International Mission Board declared churches making a difference are bold witnesses. He emphasized that every time a church divides or has an argument, the cause and name of Christ is dishonored. “The plan is to birth churches out of churches, not out of division, although God can take that situation and use it,” he said. Jordan suggested there is a lack of passion and a plan to reach lost people with the Gospel. “We have members sitting in pews contemplating how they can make their pew more comfortable,” he said. Reading from Isaiah 30:19, he reported when he needs a word from God, He is faithful to speak to him. Tony Kennedy, president of Oklahoma Baptist Homes for Children, reported several praises to the directors. “Our work in the adoption ministry has been launched with six women who chose life and are working with us in this area,” he said. In 2008, OBHC recorded 168 salvation decisions, ministered to 251 children and saw 250 ladies chose life for their unborn babies through Hope Pregnancy Centers, Kennedy said. Robert Kellogg, president of the Baptist Foundation of Oklahoma, commented on the last nine months on a roller coaster in capital markets. But, he said, there is a silver lining. Economists have said March 7 was the low point in the market cycle, and things should begin to improve. However, he reported it takes an investment return of 100 percent to offset a 50 percent loss. “We anticipate a decline in gifts, but we remain committed to our mission,” he said. Bill Pierce, president of Baptist Village Communities, told directors the word “retirement” is no longer in the Baptist Village name. Pierce said there was a big bond fire at the last BVC board meeting, where they burned a $20,050,000 note. He also said BVC is building 48 new apartments in Broken Arrow—24 assisted living and 24 memory support units. Mark McClellan, dean of the school of Christian service at Oklahoma Baptist University, filling in for President David Whitlock, said OBU has a fresh commitment to serve churches in Oklahoma. He reported 247 graduates this spring and that students will be involved in missions in Mexico, Missouri, the Middle East and Asia. In other action, BGCO president Emerson Falls, pastor of Oklahoma City, Glorieta, appointed a committee to study the convention’s constitution and bylaws. Committee members will be five former BGCO presidents: Alton Fannin, Bob Green, Wade Burleson, James Robinson and Ted Kersh. 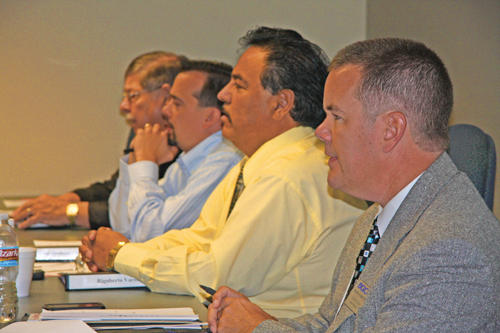 The next meeting of the board will be Sept. 22 at Falls Creek Baptist Conference Center.